Home Lifestyle/Food Who Else Wants to Know How a Urine Test is Done and How to Pass it? While Cannabis is legal in 24 States in the U.S. (as of today) and many countries around the world, for medical or recreational purposes, a lot of companies still put their employees through cannabis tests on a regular or random basis. As a result, a lot of people want to know how to pass a urine test. There is no scientific evidence that off duty Cannabis use for medical or recreational purposes have any negative effect on work performance. As unfortunate as that, before we go through HOW to pass a urine test it’s a good thing to first look into what kind of Marijuana tests to expect? 75% of the time, companies use the Urine Drug Test to check for illegal substances in a person’s system. 25% of the time, companies perform drug testing by means of testing the hair and saliva of their employees, although these methods of testing are only typical for high positions within the company. For Cannabis users who are dealing with a Urine Drug Test, this article will let you understand more on how this type of test is conducted and how you can effectively pass the test with three different methods. The answer will depend on the method you use but typically, if you practice a proper diet and exercise regime, you may have marijuana in your system for around 30 days. In some cases, for people who weigh 200 lbs (90 kg) or more, it can remain in their system for up to 60 days depending on levels of toxins and fat that person has. Unfortunately Cannabis use can show up in tests for a long time, as opposed to dangerous drugs, including alcohol and heroin that only show up on tests for a few days if that. To add to that, Marijuana can also be detected in your hair follicles for up to 6-12 months but most labs only test up to 90 days after hair growth, to know more about the Hair Drug Testing, click here. How is a Urine Drug Test conducted? This is conducted by urinating a minimum of 30 ml of urine into a specimen cup by means of clean catch. You may be asked to leave all your belongings during this procedure and will also be aided by a technician or a nurse for validity. For cannabis users, the urine is then measured to check for metabolites or processed THC that has broken down through the body. A negative result is determined by no more than 50 ng/ml of metabolites in the urine, anything greater than that may give out a positive result. The urine drug test is obviously not only for Cannabis, it is also effective in determining if a person has used other substances. However, as I mentioned above, these other substances show up on tests for a significantly less amount of time. With proper diet and exercise your body can naturally eliminate THC in around 4-6 weeks after use. This method is highly recommendable for people who have the convenience of time, because the natural way is the best way to go about things. So if you are lucky enough to have up to 6 weeks to your upcoming test, below are tips what you need to do to ensure you are good on the day. If you don’t have as much time, scroll down to check out the other two methods. Drinking a lot of water – Hydrating yourself properly can have your body naturally excreting fluids out of your system throughout the day. This is very important, so remember to drink water regularly throughout the day and aim for 70 oz (2 liters) or more every day. Eating green and leafy vegetables – by eating food like spinach, broccoli and kale your body can replenish itself with micronutrients that can boost up your immune system. Eating your veggies can also give you high levels of vitamins and is very good for your overall health. Green smoothie time! Adding lots of Fiber to your diet – Having fiber in your diet can provide you with the proper nutrients to help in detoxing, fibers usually found in non-enriched wheat, grains and legumes, which include, soy, peanuts and beans. Lemon juice or Lemonade – Lemon juice contains Vitamin C, which is very good in cleansing the body and boosting the immune system. Lemons also have very high levels of electrolytes that can help with detoxing. Buying natural, fresh lemon and turning it into juice is the best way to go about this, and not by drinking pre-mixed juices or the powder. 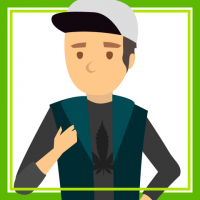 Abstinence from Cannabis – The worst part of preparing for a test is that you have to abstain from cannabis use during the 4 – 6 week period. This may be challenging for medical patients, however at this time in history, unfortunately, it is a reality for many of us. Having to stop using medication prescribed by medical professionals to be able to keep our jobs. Most people who are reading this article may have a drug test coming up soon, and let’s face it, you could be in need to get THC out of your system in less than a week! If you are one of these people, don’t worry; there are a lot of natural detoxification products out there that can make this possible for you. These products aid in flushing out the system with herbal supplements combined with a healthy detox diet, easily getting rid of any residue in your urine and blood, in a matter of days. Research these products and find the one that best suits your needs and preference. Make sure you keep an eye on the time you have available until the test. If you really need to have that quick solution, there are temporary detoxifying products that can flush out toxins in your system right on the spot. These products work by flushing out toxins out of your main organs, the bladder and urinary tract, giving you at least a 6-hour window of clean urine. However, once effects wear off, THC metabolites and toxins find their way back to these specific organs again. Same day cleansing can only be 100% accurate if you get the right product. Disclaimer: Please note that this article represents the opinion of the author and does not encourage anyone (in any shape or form) not to act in their full responsibility during any drug test. Neither the author nor Greendorphin Media takes any responsibility for actions taken on the content of this article. Please consult a medical professional if in doubt about any of the products mentioned in this article. Do you have to face constant drug tests in your workplace if so, what method do you use to get ‘clean’ for the test?